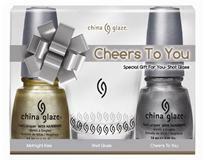 Not only do we have the enticing 16 shades to look forward to (end of October) from the China Glaze 'Tis the Season Holiday Collection, we also have the option of purchasing some of these LE gift sets. Some of them include a shot glass, peppermint cuticle oil, a stuffed reindeer, and a candle. 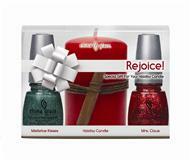 These would make fabulous gifts for your friends...or if you're like me, fabulous gifts for myself! I'm very excited to see this collection. 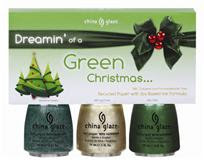 China Glaze always does such great glitters. That green collection is making me jump over the moon! Hurry up and come out polish. I want to play. These sets are to die for!! I really wish I could find these where I live... they look awesome!! 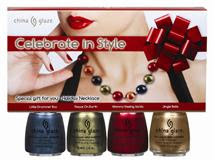 I don't love the necklace; but I best like the colors in the Celebrate in Style gift set.